Anyone who thinks that Amish quilts are too traditional, old fashioned or stuffy, this is for you. 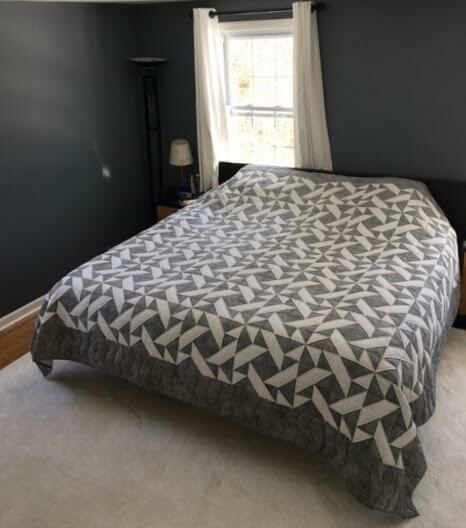 Here are images of a client’s bedroom – with Amish quilts. 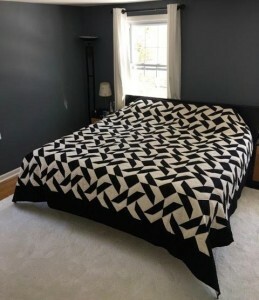 Our client liked two quilts enough to purchase both of them. The bedroom is modern and clean of line and in design, texture and color. The designer of this bedroom makeover worked with the quilts. Originally an area rug was chosen that had a white geometric pattern over a dark field. However, it was felt that this rug would fight with the quilts. The designer ended up choosing a large white area rug framed by a newly exposed hardwood floor to set off and contrast nicely with the quilts. It’s a great look and a job well done!